As you know I bake regularly for a cafe in Tramore. 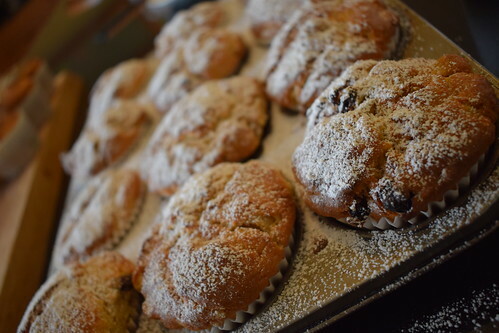 We decided to try muffins as an addition to the menu. I then had the happy task of trying some flavours out to the critics at home. I debated before- (mostly with myself) what the differences are between a cup cake and a muffin. For me- it’s two things- I don’t believe that a muffin needs icing. Whereas a cupcake looks unfinished if not iced. The other is the texture and taste, the cupcake is just a miniature cake, whereas the muffin is not so refined, generally not as sweet and often flavoured with fruit. This baby is just belting out the healthy eating vibes. Chia seeds are the buzz food of 2016, and add a nice topping and texture to the antioxidant busting blueberries in the mix. This took a little longer to make, peeling apples is a pet hate of mine. But I got through it- thanks for the concern. These ones had no specific topping, so I dusted them with some icing sugar. 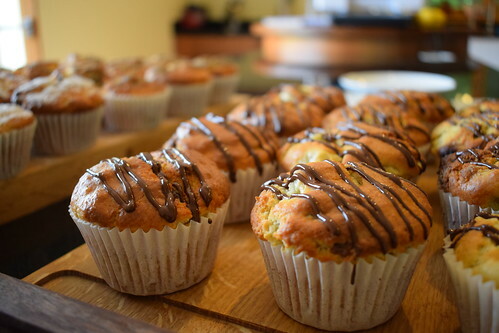 These muffins were nearly too light in texture, which was odd really, as banana tends to make bakes a little soggy. Tasting went according to plan, and was civilised for a change. As usual we all had differing favourites. ME? I think the banana and chocolate is a smidgeon ahead of the apple and raisin. But really, I’d eat any of them. Might try savoury ones next…. I got this book as an offer with my new Peggy Porschen “Love Layer” book. And really I have no idea why it’s taken me so long to bake something from it. I set my youngest the task of choosing what to bake, and we actually both came up with the same idea. Banofee Cupcakes. All in all it was going to be a winner. As always when I’m making a recipe for the first time, I followed the recipe religiously. When I got to the part about filling the muffin cases I ran into a little difficulty. The method said to use an ice cream scoop to put the batter in the cases. But my batter was VERY licky, so I just poured. Then injecting the salted caramel (I bought some- I know, I know- but it was late!) was tricky, even with my filling nozzle. They went into the oven with a bit of a prayer, and soon the kitchen smelt just fabulous. Family members casually walking into the kitchen sniffing the air. The icing was just SO good, a creamy blend of mascarpone, cream cheese, and icing sugar. Decadence, and not cheap either- relegating them to special occasion cupcakes. I should have mixed the salted caramel through the icing, but followed the recipe, to “drizzle” it over after piping. My caramel was too thick, and although I could have warmed it, it was very late at that stage, and the wolves were circling for tasting. To be honest, my food photography was seriously lacking. Maybe the smell of goodnesss overpowered me. But judging by the number of likes on FB when I posted the half eaten one- they did look good! 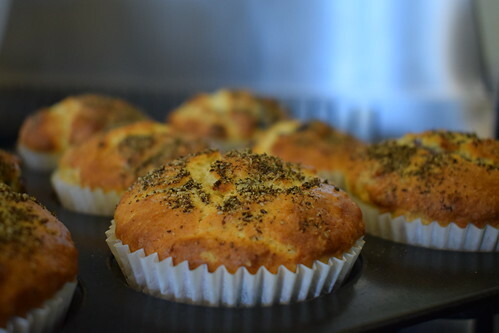 I would definitely make these again, and am thinking of trying the recipe as a cake next time. I think because there are so many bakeries in London doing a similar thing, for me Lola’s gets a bit lost. But if I spotted them as I was passing, I would go in and try one!